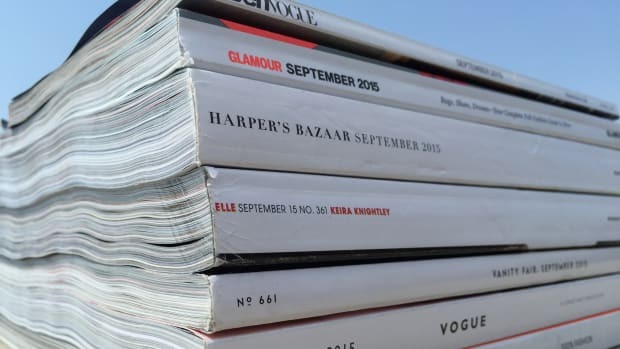 Every year around this time, publishing houses excitedly proclaim how their magazines are set to debut their biggest September issues EVER. September issues 20 years from now are going to be, like, 2,000 pages just because of this need to make each one bigger than the last. To that end, Hearst has announced that this September will be its biggest September ever in terms of page numbers and ad revenue. And thanks to an apparently flourishing luxury market, fashion titles saw the most growth. Elle&apos;s September issue will be the largest Hearst magazine ever published(!!) with 465 pages of ads, a 5 percent increase over last year. Coming in second will be Harper&apos;s Bazaar with 444 pages (also its biggest issue ever), a 12 percent increase over last year. Marie Claire saw its pages increase 6 percent to 261 pages (its biggest issue ever), while Cosmopolitan saw an 8 percent increase to 185 pages. Town & Country saw a whopping 20 percent increase to 137 pages. One luxury brand spending big is Coach: In the midst of a revamp meant to take the brand in a more high luxury, fashion-forward direction, the company is sponsoring Harper&apos;s Bazaar&apos;s entire Carine Roitfeld-edited fashion portfolio. But, there&apos;s still a lot more to this story. Condé Nast has yet to release its preliminary ad pages and we still don&apos;t know which stars will be covering these all-important issues. Any guesses? 'Vogue' wins again, while 'Lucky' and 'Teen Vogue' aren't doing so hot. So we bought newsstand copies and counted their ad pages by hand.